Eagle Group launches it newly enhanced website. 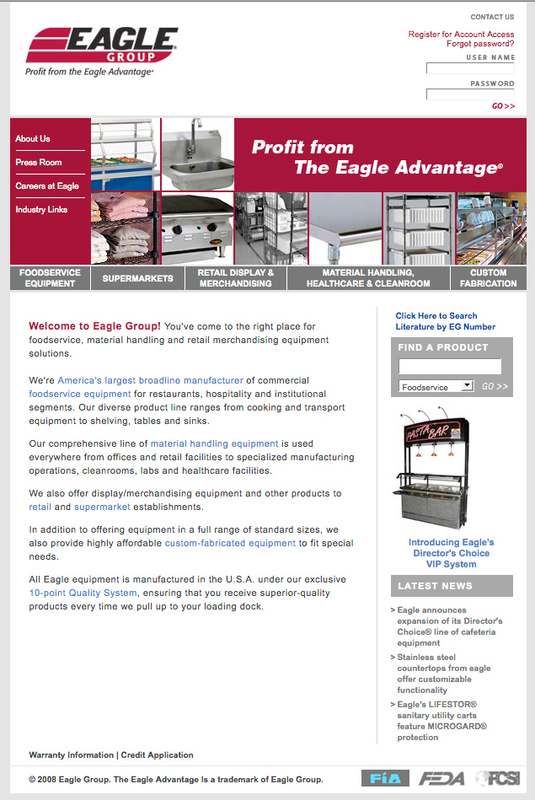 The enhanced site brings together information on the company's more than 15,000 manufactured products, including foodservice equipment, material handling, retail, cleanroom and healthcare equipment, as well as, providing services to End-Users, Dealers and Reps.
Eagle Group announces the launch of its newly enhanced corporate web site at http://www.eaglegrp.com. The enhanced site brings together information on the company's more than 15,000 manufactured products, including foodservice equipment, material handling, retail, cleanroom and healthcare equipment. It also provides detailed information on Eagle's Spec-FAB® Division for custom modifications. Eagle's web site is designed to meet the information needs of end-users, equipment dealers and distributors as well as consultants, architectural firms and others who seek the right equipment solutions to meet their specific needs. One of the most important functionalities of the site is a password-protected area that provides Eagle dealers and distributors with real-time access to data such as order shipping status and inventory equipment specials, making the Eagle site an important daily "go-to" resource for customers. Other important web site functionalities include an interactive "Find a Rep" section for dealers, "Find a Dealer" section for end-users and a "Find a Service Center" function to assist visitors in determining the closest center for equipment maintenance. Eagle also provides a number of helpful user functions on the site, such as the ability to download CAD symbols to use in a plan or schematic layout within a designated floor plan, as well as the ability to download Eagle's complete literature library. A convenient quotation request function makes it easy to specify components and request a quote with just the click of the mouse. According to Larry McAllister, president, web site development was guided by input from Eagle customers, including dealers and distributors. "We asked them to tell us what they wanted in terms of online access to information. By responding to their needs, our site is a valuable resource not only for information on our product line, but also for formulating equipment specs and plan layouts," he said. "We're proud to unveil this web site as it clearly illustrates we're in the forefront of providing online access to information for customers in our markets," McAllister added. To view all of the new web functionalities offered, visit the Eagle web site at http://www.eaglegrp.com. Eagle Group is America's largest broadline manufacturer of commercial foodservice equipment, offering a multi-faceted product line ranging from stainless steel sinks and tables to shelving and transport products, underbar equipment, cafeteria equipment, plus countertop cooking and warming equipment. The company also manufactures a full line of material handling equipment and shelving products engineered for industrial and assembly applications, cleanrooms, laboratories and healthcare institutions. Headquartered in the USA, Eagle Group products are sold throughout North America as well as Latin America and other overseas markets. For more information, contact Eagle's Marketing Department at 800-441-8440 or 302-653-3000, ext. 3129. Web site address: http://www.eaglegrp.com. Eagle Group's newly enhanced website.